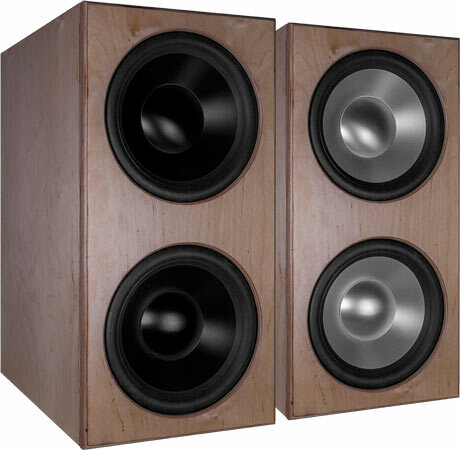 Don MK2 extrem is a versatile subwoofer which complements the rest of the loudspeakers with a powerful and deep bass. Through the use of two passive radiators the maximum SPL and precision on very low frequencies is getting better. Don MK2 extrem is a loudspeaker with drivers of Wavecor. A passive radiator provides deep bass. The paint of the membranes you can select between silver and black. In Don MK2 extrem is usesd a Audaphon AMP-2200 with DSP and a power of 2x 200 watts on 4 ohms, or 1x 350 watts on 4 ohms in bridged mode. The Audaphon AMP-2200 have a DSP to programming some crossovers, equalizers and delays. The power of the AMP-2200 is high enough to work with two Don MK2 extrem subwoofers. The Don MK 2 extrem kit without amplifier has two connectors PK28 included to connect two subwoofers with one AMP-2200. The AMP-2200 amplifier have also two RCA outputs to control the satellites with the DSP.